They're mundane, yet daunting tasks: Tidying a messy room. Assembling a bookshelf from a kit of parts. Fetching a hairbrush for someone who can't do it herself. What if a robot could do it for you? Assistant professor of computer science Ashutosh Saxena is working to bring such robots into homes and offices. 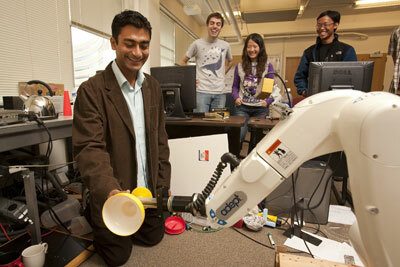 He leads Cornell's Personal Robotics Lab, which develops software for complex, high-level robotics. Among the lab's goals are programming robots that can clean up a disheveled room, assemble an Ikea bookshelf and load and unload a dishwasher -- all without human intervention. Saxena, who joined the Cornell faculty in 2009, believes robots can make people's lives better and more productive. "Just like people buy a car, I envision that in five to 10 years, people will buy an assistive robot that will be cheaper or about the same cost as a car," Saxena said. One of the biggest technical challenges is endowing robots with the ability to learn in uncertain environments. It's one thing to make a robot do simple tasks: Pick up this pen. Move to the left. Do a 360. It's quite another to make a robot understand how to pick up an object it's never encountered or navigate a room it's never seen. Saxena, who led the manipulation group in the STAIR project (Stanford Artificial Intelligence Robot) at Stanford University, has researched how to make robots perceive information in cluttered and unknown environments. His work has also enabled robots to estimate depth from a single image. "For example, if you look at a new object, how would you pick it up? If you are in a new environment, how do you figure out how far away things are?" he said. On a typical afternoon in Upson Hall's Personal Robotics Lab, Saxena and his students can be found huddled around a computer perfecting the coding to make their robots come alive. One of their research platforms is a robotic arm with a gripper. Using a camera, the robot evaluates an object -- say, a cup or plate -- and figures out how best to grab it. This technology will eventually integrate into the full-fledged dishwasher-loading robot. Graduate student Yun Jiang has worked on a fast, efficient algorithm to make the robotic arm identify what she calls "grasping points," or the parts of an object that would be best to grab onto. Her main contribution has been to simultaneously find both the location and orientation of the arm when it is picking up an object. Writing such programs involves finding the balance between the specific features of an object -- from the stem of a wine glass to the handle of a brush -- and the general geometric patterns that can serve as guidelines for the robot to identify. "Although the objects may differ in appearance, they should share some common grasping patterns, and those patterns have some features that we are looking for," Jiang said. Writing an algorithm that can identify generalized features and apply them to a wide variety of objects is a difficult challenge, Saxena added. Another set of students works on a roving robot with a camera. Its job is to find an object, such as a shoe, by systematically scanning the room. "In a cluttered room, it is notoriously difficult for today's object detection algorithms to reliably find an object as simple as a shoe," Saxena said. The key is to not look at this task in isolation, he explained. If the three-dimensional structure of the room is known, it becomes easier to find the objects. The lab is building learning algorithms to enable roboticists to quickly combine several perception algorithms into a more reliable one. Graduate students Congcong Li and Adarsh Kowdle presented these projects at the European Conference on Computer Vision, held in Greece Sept. 5-11. They will present again at the Neural Information Processing Systems conference in Vancouver this December. Saxena sees the robots one day making a critical difference in people's lives -- for example, among the elderly or people with disabilities, who need help for everyday things. But robotics could also make people's lives easier in general. "There are so many people who just want to get household chores done," he said.